The $Logfile in NTFS file systems is a transaction journal of changes to the $MFT. You can commonly find file fragments and MFT records in this file. 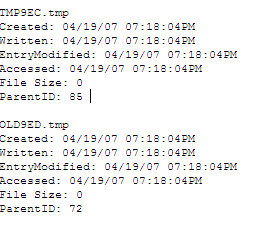 You can also sometimes find MFT records in unallocated space. MFT records are fairly easy to read once you know the structure, but I wanted an easier what to extract them and put them in a report type display. The value of searching and looking for old MFT records is that you can often find MFT records that show the filename of a file that no longer exists and extract the metadata about that file, such as timestamps and what the parent folder was. In the future I will add the search function into the script itself so you don't have to manually perform the search, I was just lazy and wrote it to fulfill a quick need. I also have an Enscript that will decode INDX (directory entries) records found in the $logfile (or any other file you wish) which I will publish soon. but the Information provided is really good! Can I get some more insight on what and where in MFT records to look for, considering a Practical approach using a Winhex's Xways Forensics tool.